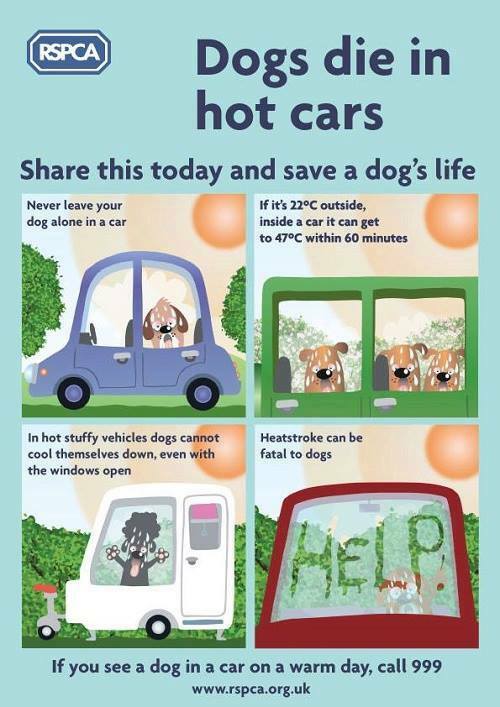 Once the weather starts warming up we start sharing pictures and blogs about the dangers of leaving dogs in hot cars. However, no matter what we do we still see cases of dogs suffering with heat stroke. Some dogs are treated in time, but others are not so lucky. If you see a dog locked in a car do you know what to do? Do you wait for the owner to come back and confront them? Do you call the police? Do you call the RSPCA? Do you smash the windows? A lot of people are not sure so hopefully this blog will help answer those questions. Why is a hot car dangerous? As we have mentioned, we see a lot of cases of dogs with heat stroke because they have been kept in a car. No matter what we have shared there are individuals that still think it’s ok. The usual excuse is “oh its only for a short while, it will be ok” but even a short time in a car can have a negative impact on the dog. If the car is in the shade a car can become as hot as an oven. When it’s 22 degrees, in a car it can reach an unbearable 47 degrees within the hour. If you see a dog locked in a car you should call the RSPCA on 0300 1234 999. They will be able to advise you on what to do next and talk you through the next steps. However, they do not have the power of entry so will need police assistance. Do you know the symptoms of heatstroke? Take a look at our blog HERE. If you see a dog in a car showing signs of heatstroke call 999 immediately. They will be able to get to the scene quickly and get the dog out of the car. Dog is not showing signs of heatstroke – What to do. If the dog isn’t showing signs of heatstroke then calling the police and breaking into cars may be a bit premature. Again, call the RSPCA for advice and speak to one of their advisors. If the car is in a supermarket or a venue/event ask for an announcement to go out over the tannoy so the owner is aware and goes back to the car. If you need to go and get help try to leave someone at the car to monitor the dog. If the dog’s health worsens call 999.